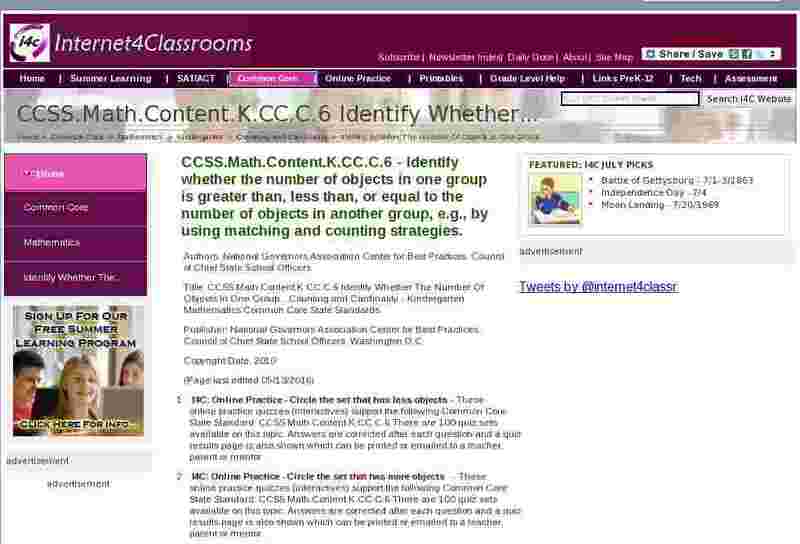 CCSS.Math.Content.K.CC.C.6 - Identify whether the number of objects in one group is greater than, less than, or equal to the number of objects in another group, e.g., by using matching and counting strategies. I4C: Online Practice - Circle the set that has less objects - These online practice quizzes (interactives) support the following Common Core State Standard: CCSS.Math.Content.K.CC.C.6. There are 100 quiz sets available on this topic. Answers are corrected after each question and a quiz results page is also shown which can be printed or emailed to a teacher, parent or mentor. I4C: Online Practice - Circle the set that has more objects - These online practice quizzes (interactives) support the following Common Core State Standard: CCSS.Math.Content.K.CC.C.6. There are 100 quiz sets available on this topic. Answers are corrected after each question and a quiz results page is also shown which can be printed or emailed to a teacher, parent or mentor. I4C: Printable Worksheets - Circle the set that has less objects - These worksheets support the following Common Core State Standard: CCSS.Math.Content.K.CC.C.6. There are 100 worksheets available on this topic. A master answer key is available. I4C: Printable Worksheets - Circle the set that has more objects - These worksheets support the following Common Core State Standard: CCSS.Math.Content.K.CC.C.6. There are 100 worksheets available on this topic. A master answer key is available. Few or Many? - Click the object that has few or many. Click on the word Again to try another one. Fish Feeder - Online game; click on the bar with the correct sign to feed the fish. Greater or Less than - Center Time activities with materials to print. More or Less - Choose the group that has more or less according to the directions. More or Less - Set up the game clicking on the More or Less tab. Drag the correct bug to the monster to feed him. More or Less - Sesame Street video; explaining more or less. More, Less, or the Same? - Count the objects on each side and decide if they are more, less or the same. Students must recognize the words. Same Number of Things? - Drag the group on the left to the group that has the same number of things. Which is More? - Interactive quiz comparing two groups of coins. Who Has More Bugs - Decide whose hands has more bugs.